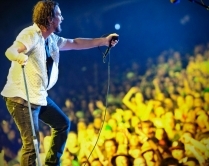 Eddie Vedder has confirmed the rescheduled dates for his 2012 solo tour. Earlier this year the Pearl Jam frontman postponed a series of dates due to nerve damage in his right arm. Vedder’s fall tour will kick off on Halloween at Las Vegas’ The Pearl and wrap on December 4 at Ruth Eckerd Hall in Clearwater, FL. Special guest Glen Hansard (The Swell Season, The Frames) will again join Vedder on the road All tickets purchased for Vedder’s original dates are valid for the corresponding new dates.